Bloggers. We're writers. Journalists of our own news. Not everyone likes to write, of course, and for some, keeping a blog or journal can seem a daunting endeavour. But it doesn't have to be so. Sometimes, all you need is a few words. That's all. Just a few words that describe a moment in the day, an incident, a thought, a bit of advice. 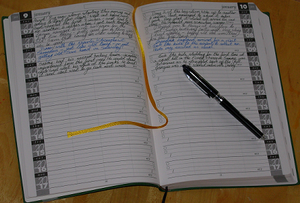 Recently, I was given a wonderful opportunity to review a fabulous product called Journal10. This marvelous Journal is just a line or two for each day. No forbidding empty page to fill. It's also covers 10 years! Can you imagine the family history that can be recorded for future generations? That appeals to me as an Historian. I find it emotionally satisfying as well. It will connect me to grandchildren and great-children and so on down the line. The book is soft-bound, light-weight, and not much bigger than my Bible. It has a very traditional, classic style. I love it. What makes Journal 10+ different from other journals? The Journal10+ that I received began on January 1, 2012 and ends December 31, 2022! It will take me from 51 to 62 years old... and my daughter through her 20s, ending when she is 32. So much history... so many stories... tears, laughter... I can record them all in one place. I love this journal. There are Looking Ahead pages, Carry-over pages, an Address Book, Tracking pages for Meds. It's so well-thought out and so well arranged. Buy two. Trust me. Give one to someone you love -- you (and they) will cherish it. I was so pleased when the wonderful folks at Journal10 generously offered one of my readers the chance to win a journal of their own. That's such a lovely gesture and I really appreciate it! Just follow the instructions below to enter for your chance to enter to win! I received a Journal10+ for the purpose of review. I received no monetary compensation. The opinions expressed herein are my own and based on my own use of and experience with the item(s). Prize will be shipped to winner directly from the sponsor. id like to record positive affirmations. I learned that there's a page for 'Goals' & that would help me! i would like to write the wonderful roses i receive everyday from the One who affectionately and carefully loves me. I learned that they a "Smythe-sewn" binding, the most durable binding method for high-quality journals. Love the fact there is no pressure to full a whole page. I learned that it has sections to record medical history. This would be great for my niece who never forgets anything.Plus I learned that there is a goals section that would would also benefit a young person. I have been thinking about journaling lately. I have been through quite a bit in my life, and I have begun to think that putting my thoughts down about the past, present, and future could really help me take a step in the healing process. I wish I could keep myself on point to actually journal. I use them to keep track of blogging stuff and passwords, etc. I learned that it can hold up to 11 years of journaling. I love that it has plenty of overflow pages. Very handy. 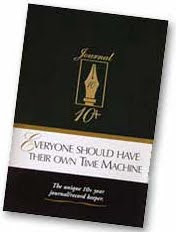 I would LOVE this product because I try to keep up with journaling, but I get busy......life happens. This would allow me to actually keep track of my days in a fun, structured way! Captures personal and family development and milestones! I would love to do this. 11 years of notes in one volume.. I'd love to record just ordinary daily things. Things that were important and also little moments with the kids I'd want to always remember and look back on. Maybe even show them one day. Love how you don't have to fill up a whole page - just a line a day. This is awesome! I have tried to start so many journals, but you are right about the empty pages. 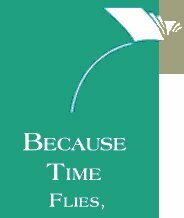 I end up writing a novel each day and then get burned out quickly and give up. I want to leave something for my kids so they know the real me and how much I love them and this would be great! Thank you for the chance to win! I would use it to write funny things my son says or does. i would record my kids firsts, work information and medical information. learned that it can hold up to 11 years of journaling. I would record funny things my children do. I like that it has a Goals section. something to be thankful for each and every day! I learned that the Journal 10+ holds up to 11 years worth of notes, etc. Wow! i would want to record birthdays and appointments,and important family news and updates!!! 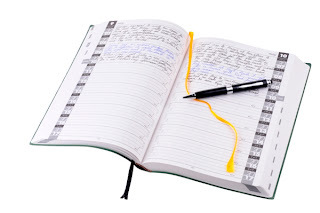 I'd like to record events that took place in my life on each day. Gratitude, on a daily basis!